LC I chose the bird because I used to have this habit of collecting dead things when I was growing up on my dad’s farm. I would bottle feed an orphaned lamb and then we’d eat it for lunch, which was a little brutal so I got used to eating my pets. I suppose I wanted to preserve the bird in some way, to look at this process of life and death in a mindful way – and even now I want to connect things back to the environment somehow through my work. GB Your hats are made through quite technological processes. LC I might use bits of dead things some day but I feel like that’s a bit too Etsy right now! A lot of people do put dead birds and wings on their hats but I want to be a bit more pioneering than that. I’m a bit over my death obsession. I think it’s turned into an obsession with life! 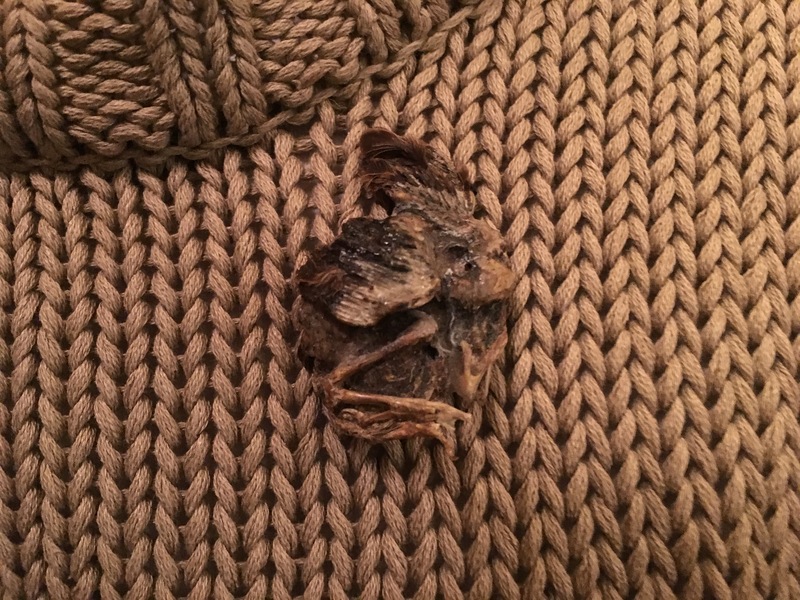 GB Do you think that when you made the dead bird into a brooch you were trying to challenge ideals of beauty? LC I did see the baby bird as really beautiful but then I tend to like the weirder things I see. I suppose now I’m trying to challenge the fashion industry through fashion artefacts that cross over between fine art and fashion even though a lot artists I’ve spoken to really don’t like that idea. GB has the dead bird changed a lot over time as it’s decomposed? Is there a stage at which it was more beautiful? LC When I first saw it, it was already dead and it had fallen out of the nest. It was pretty much in this position but it still had a bit of life about it somehow. I just thought it was sad and I didn’t want my cats to eat it. It dried out like this. I didn’t need to pin it like you would with taxidermy. I made it into a brooch straight away. I was fourteen and a bit emo. The inspiration was a bit Alexander McQueen and a bit Avril Lavigne! I had a collection of dried frogs from my mum’s place in Canada. It was only when I moved from the farm to London that people started to think it was a bit weird. I could go for days without seeing anyone when I lived on the farm. It was quite isolated. I’ve made hats out of fly papers so the flies stick to them as time goes on. I’d like to do that again. I don’t like the idea of the flies dying but the look of the work is quite poignant. GB Do you see fashion and natural beauty as different forms of beauty? LC I guess the fashion that I like is quite natural, or you can see that it’s a translation of something that comes from nature. We’re surrounded by good simple design now, I like to see things that have a bit more to them. GB Do you think beauty is relevant to your crossover world between fashion and fine art? LC More so now than ever because everything is so Instagram-driven. I don’t like that an impression is made and then it’s over so fast. I think I like things with a story behind them that’s somehow sentimental. That’s stylish to me. It’s about having your own personal style. I like things that can’t easily be replaced more than I like something brand new. GB So do you wear a lot of things that mean something to you? LC Yes, I almost chose this ring that I wear every day. My dad gave it to my mum before I was born. She later moved to Australia, leaving my brother and me behind. I was four and we stayed at the farm. She moved to Canada nine years after that and I went to visit her and I found this ring. It was all broken and I think it brought things back to her. She gave it to me and when I got back to England my step-brother fixed it for me and my step-mum gave me the emerald that’s in it now. So in a way it symbolizes my family. LC It has to be aesthetically beautiful but beauty isn’t just about how it looks. There has to be an emotional and an intellectual side to it. I find that like-minded people tend to find my bird brooch beautiful. It’s almost a test of how they see the world. It’s also about permanence versus ephemera which is what I find interesting in fashion. Some things don’t have to disappear when the season’s over.